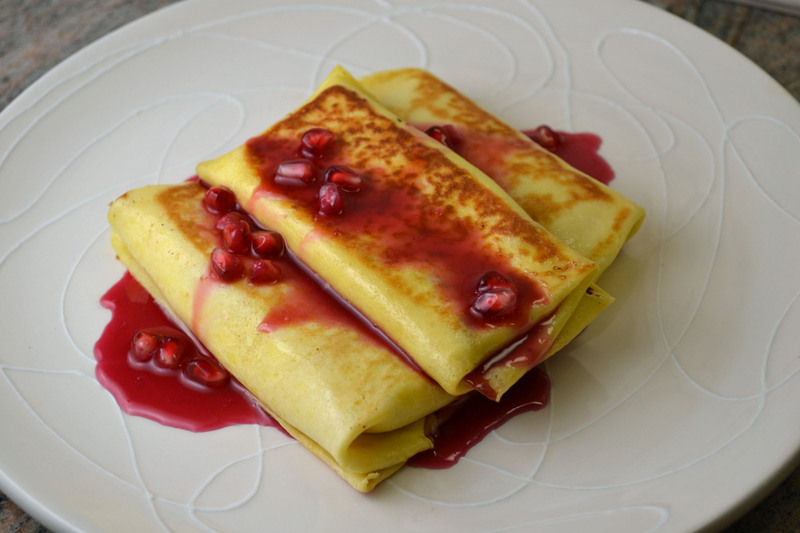 Blintzes are one of those dishes that almost everyone has heard of but few have actually bothered to try. Popularized by Jewish immigrants, Blintzes are often sold frozen, next to Knish or even Bureka in a low profile section that the grocery store may refer to as “ethnic foods.” This is not usually a good representation of Blintzes. These crepe-like packages are surprisingly tasty when made fresh and the toppings and fillings (to some extent) are as versatile as you want them to be. This unpublished traditional batter recipe and farmer cheese filling came from my great grandmother, Shirley Zweier (Paula Peck’s mother). It may come as shock but Shirley was not a particularly good cook. Stories involving her and food usually revolved around her grocery shopping habits – like taking a bite out of a whole tomato and putting it back on the shelf/pile if she didn’t like how it tasted. Anything she made in the kitchen had to be simple and this recipe is no exception. The batter for these blintzes is similar to that of a pancake, but thinner and does not contain any leavening. The simple mixture of flour, egg, and milk is used to create large crepes that can be rolled or folded around the sweetened cheese and raisin filling. Since the batter and filling are fairly traditional, I took some liberties with the toppings. 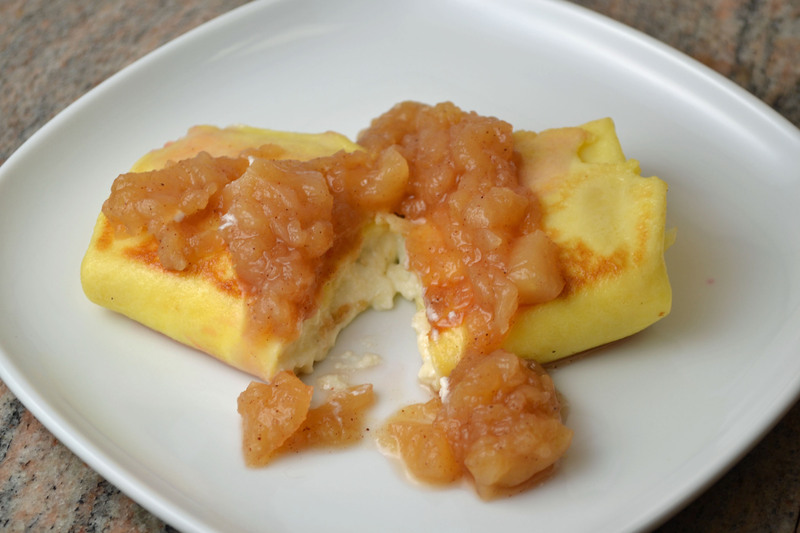 My father remembers these blintzes served with a more old-fashioned apple sauce topping (which I’ve provided below). It’s hard to go wrong with seasonal honey crisp apples sauce as a complement to the creamy cheese filling. However, the winner here is the pomegranate sauce. Yes, it’s totally untraditional. But with its tart and tangy bright flavor, it rounds off the mild sweetness of these dessert-like packages just perfectly. Whisk eggs and flour in a medium mixing bowl. Add just enough milk to make the consistency of light cream. Allow mixture to stand for at least an hour. If it thickens, add a little more milk. Heat an omelet-style saute pan over low heat. Brush with melted butter. Pour a small ladle of batter into pan. Tilt pan so that batter is thin and evenly distributes in the shape of a flat pancake. Allow pancake to dry. Turn out on a sheet of wax papper. Continue with remaining batter. While pancakes cool, make filling: mix cheese with sugar and eggs. Add sour cream and vanilla. Stir in raisins. Cover and place in the refrigerator until pancakes are ready to handle. Place a heaping spoonful of filling in the center of each pancake and fold like a package or burrito. Reheat omelet-style pan over medium-low heat and brush with butter. Saute blintzes a few minutes on each side until just lightly browned. Serve with Pomegranate Sauce or Chunky Honey Crisp Apple Sauce (recipes follow). Set aside about 1/3 cup of the pomegranate seeds. Juice the remaining seeds by crushing in a sieve. Discard crushed seeds. Preheat a medium saute pan over medium heat. Add pomegranate juice and honey. Bring to a boil then reduce to a simmer. Create a slurry with the cornstarch: whisk a few tablespoons hot pomegranate juice with the cornstarch in a small bowl until smooth. Add to remaining juice in pan. Bring to a boil and then allow to simmer until thickened. Allow to cool a few minutes and then add 1/3 cup seeds. Note: store bought pomegranate juice (100% juice such as POM) maybe used to save time (instead of juicing seeds). Peel apples. Rub with lemon to avoid browning. Dice apples. Heat a saucepan over medium heat. Add apples, sugar, cinnamon, and 1/2 cup water. Bring to a boil and reduce to a simmer. Allow to simmer for 20-30 minutes, stirring every few minutes until apples are soft and beginning to break up. Add another 1/4-1/2 water if apples appear too dry during the cooking process. Stir with a fork to break up apples even further. Remove from heat and allow to cool before serving.